Thriller/dramedy (comedy drama) about the Voodoo priestess Marie LaVeau and the Vampire that tries to kill her. Setting: An occult parlor, in the French Quarter and other places where the arts of black magic and voodoo are practiced in New Orleans. Weâ€™re in the death mind of Marie LaVeau II, a legendary healer still celebrated today. 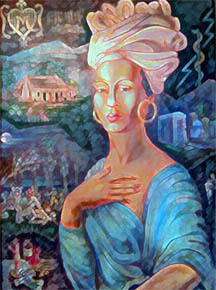 Itâ€™s June 15, 1881, at seven p.m., the death hour of Marie LaVeau. FantÃ´me an experience Creole Vampire and other ghostly intruders urge the Vampire Lâ€™Esprit to commit his first murder for blood and take Marie LaVeau to hell. The daughter of a white planter and a black free woman, Marie uses all means available to snare the Vampire and live again. She goes through a death travel encountering snakes, devils, violent screamers in Congo Square. She sees her teen daughter Annic, failing going blind, and singing in the streets for a crust of bread. Marie attempts to rescue her only to have Phantome, the experienced Vampire murder the girl to show how sweet and quick young death can be and how the Vampire should kill Marie. But the he has fallen in love with Marie and doesnâ€™t want to kill her, and now Marie holding her dead daughter, Annie prays to die. The story resolves as the Vampire takes her life and in severe remorse promises to return to earth to â€œgrow kinderâ€� on the next trip. Marie Lavearu - Créole Voodoo Priestess of stunning beauty, she seems to be in her 20s but is actually much older. L’Esprit – an elegant young Creole man, fashionably dressed in full evening vampire attire, scarf, cape. Fantôme – a thin Créole woman, glacial appearance. 19th century occult parlor of Marie LaVeau on her death day.